Use #34Rush on Instagram to be featured on our website! Thurman Thomas & Batavia Downs are proud to bring you 34 Rush Sports Bar. 34 Rush is a celebration of Thurman's Hall of Fame Career and the world famous fare of Buffalo, New York. With an expansive menu that features everything from a traditional WNY Beef on Weck & Chicken Wings to signature dishes like "The Thurmanator" you certainly will not leave hungry. To complement our menu & illuminated bar, we are proud to display memorabilia that spans Thurman's Hall Of Fame Career. 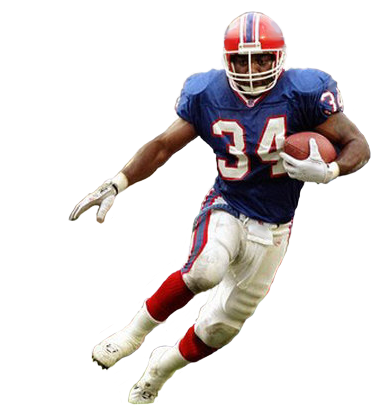 No matter where you were during the Super Bowl years of the early 90's, and no matter where you are now, the name Thurman Thomas is synonymous with Western New York. Our goal at Batavia Downs is to celebrate Thurman and his accolades, but to also celebrate the area Thurman is very proud to call home. Conveniently located at Batavia Downs!